Seven of the eight PawSox hits came off the bats of three players. Brock Holt went 3 for 4, his second straight multi-hit game. Jackie Bradley, Jr. had a pair of hits, breaking out of a 4 for 30 skid over his previous eight games. Most impressive, though, was Xander Bogaerts (pictured). 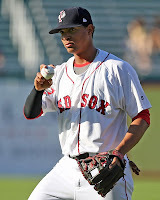 Getting his fifth start at third base, Bogaerts went 2 for 4 with a double and scored Pawtucket's only run. Said SoxProspects.com Northeast Scout Ian Cundall on Twitter: "After sitting on Pawtucket these last few games, I'm confident that Xander Bogaerts bat would play in the major leagues right now." Salem dropped its fourth straight, a 5-2 decision against the Potomac Nationals (WAS). The loss came despite a solid effort by Mickey Pena, who allowed three runs on five hits in six innings, striking out two and walking four. It was Pena's fourth consecutive quality start, and during that stretch, he has lowered his ERA from 6.69 to 4.87. At the plate, Keury De La Cruz went 2 for 4 with a run scored, while Henry Ramos had a double and scored the other Salem run. Sharp pitching led Greenville in its series opener over the Greensboro Grasshoppers (MIA), 3-1. Starter Justin Haley earned his sixth win of the season, giving up a run on just three hits in six innings, while walking one and striking out a pair. The single walk was the best sign for the righty, who has struggled with his control all season. Raynel Velette tossed two hitless innings in relief, and Gerardo Olivares struck out two in a scoreless ninth to record the save. Mario Martinez went 2 for 4 with an RBI at the plate, while Dreily Guerrero was also on base twice, going 1 for 3 with a walk and a run scored. A pair of errors doomed Lowell to a tough walk-off loss, falling 3-2 to the Vermont Lake Monster (OAK). With the score 2-2, Greg Larson induced a grounder by Wilfredo Solano, but Tzu-Wei Lin made his third error of the game, putting the winning run on second base. A sacrifice bunt moved Solano to third, and Larson intentionally walked the next two batters to load the bases, giving Lowell infielders the chance for a force play at home plate. The strategy seemed to work when the following batter hit a comebacker to Larson, but his throw home went awry, allowing the Lake Monsters to walk off with the win. Not to be lost in the defeat were solid performances from Corey Littrell and Simon Mercedes. Littrell, the Red Sox fifth-round draft pick out of Kentucky, had seen his season-long scoreless streak halted in his previous appearance, but he was back to his usual stingy self on Monday, giving up just one hit in 2 2/3 scoreless frames, striking out four and walking two. The outing lowers Littrell's ERA to 0.87. Mercedes gave up two runs on five hits in 5 1/3 innings of relief, striking out a season-high seven batters. The GCL Red Sox were able to pick up Trey Ball, coming from behind for a 5-3 win over the GCL Rays. The first batter Ball faced hit a grounder to short, but Raymel Flores could not handle it, and he reached on an error. After a walk, Ball recorded his first professional strikeout in unorthodox fashion - the Rays batter bunted the ball foul with two strikes. A double steal gave the Rays men on second and third, but Deiner Lopez was able to cut down the lead runner at home plate on a ground ball for the second out of the inning. A double by Rays number one draft choice Nick Ciuffo cleared the bases, scoring a pair of runs, and ending the night for Ball. In all, Ball's line showed two unearned runs on one hit in 2/3 of an inning, with a walk and a strikeout. As one forum contributor pointed out, the start comes nearly 11 years after a difficult pro debut by another highly touted Red Sox left-hander. On August 23, 2002, Jon Lester gave up six runs (but only one earned) on five hits in 2/3 of an inning, with one walk and one strikeout. A superb effort by the bullpen kept the Sox in the contest. Dioscar Romero gave up a run on just one hit in 2 1/3 innings. The foursome of Luis Ortega, Stephen Williams, Enfember Martinez, and Oscar Perez then combined for six shutout frames. Williams was credited with his first professional win. Mike Meyers led the offense, going 3 for 5, including an RBI double as part of the three-run sixth-inning rally. Meyers came around to score on a triple by Jordon Austin. Jake Davies and Alixon Suarez both had two-hit afternoons that included an RBI apiece. Sean Coyle continued his rehab, going 0 for 3 with a run scored. After two days off, Wendell Rijo replaced Coyle in the seventh, and the 17-year-old picked up right where he left off. In Rijo's only plate appearance, he drove in an insurance run with a base hit. Rijo has now reached safely in his last 16 games. The DSL Red Sox were shut out 6-0 by the DSL Dodgers. It was an extremely rare ineffective start from Jose Almonte, who gave up three runs on three hits in 3 1/3, walking four, while striking out three. The right-hander's ERA jumped over half a run, from 1.80 to 2.35. The offense was able to generate only five hits. Victor Acosta delivered his ninth double of the season, and Javier Guerra went 2 for 2 with a sacrifice bunt. Player of the Day: While Trey Ball's minor league experience began last night, Xander Bogaerts keeps making the case that his development is nearly complete. Getting his third start in a week at third base, he got few chances with the glove, recording just one putout. It is Bogaerts' bat that has him knocking on the door to the major leagues, however. With another two-hit night, the International League's youngest player now has a .279/.380/.483 batting line. Across two levels, Bogaerts already has 38 extra-base hits in 2013.